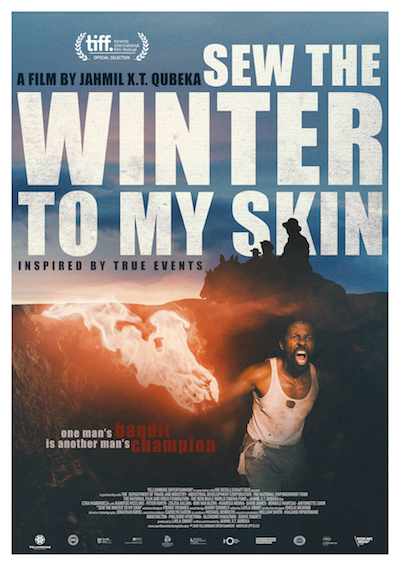 A cinematic ballad of indigenous outlaw John Kepe, Sew the Winter to My Skin explores the true myth of a legendary black rebel folk hero in mid 20th century South Africa, a time that foreshadowed Apartheid, one of the most viciously racist political regimes in human history.In the rural Great Karoo region, the bandit John Kepe terrorises white farmers, stealing their livestock and supplies to give back to his impoverished communities. General Botha, an embittered World War II veteran, becomes obsessed with the capture of the notorious Kepe and leads an epic manhunt for him through the mountains, where he is rumoured to occupy a mysterious cave. Evading capture for over a decade, outwitting Botha and the settlers, John Kepe’s raids become ever more brazen and his escapes from the authorities ever more daring. The outlaw’s legend grows in the hearts and minds of the poor and marginalised indigenous population, and the self-proclaimed “Samson of the Boschberg Mountains” emerges as both an enigma to his pursuers and a romantic object of adoration for his fellow victims of oppression.